Farid Chedid is the Founder, Chairman and CEO of the Chedid Capital Holding group of companies. 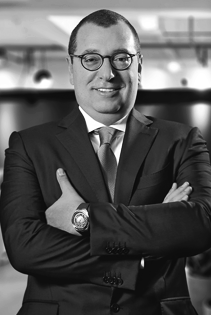 Starting with the founding of Chedid Re in 1998, Mr. Chedid embarked on a two-decade journey building one of the region’s premier insurance and reinsurance group across the Middle East, Africa, and parts of Europe. Chedid Re is recognized among the top-20 reinsurance brokers worldwide and registered as a Lloyd’s broker. Today, Chedid Capital Holding includes Chedid Re, Chedid Insurance Brokers, and Chedid Corporate Solutions. In 2009, Mr. Chedid also founded Seib Insurance Company, as a Qatar-focused company dealing with corporate and complex risks. For more than a decade, Mr. Chedid has been listed among the top 50 most influential members of the regional insurance industry. He has been publicly recognized with a number of awards, including the ‘Middle East and Africa Industry Achiever of the Year 2016. In addition to his many company board memberships, Mr. Chedid is active in support of many non-profit and professional development organizations, serving as a member of the board of trustees at Notre Dame University, Lebanon; a member of the board of Endeavor, Lebanon; a member of Human Rights Watch, Beirut Committee; a UNDP Goodwill Ambassador; and a Fellow of the Middle East Leadership Initiative (MELI), among others. Mr. Chedid is a Fellow of the Chartered Insurance Institute of the UK, he holds a Master’s in Risk Management from NYU Stern School of Business; a Master’s in Finance from ESCP Europe; a Master’s in Management from Universite Paris IX Dauphine, and a Postgraduate Diploma in Maritime Law from London Metropolitan University.